Please see Mechanical Design 101 for a collection of our recent research results as well as other interesting and useful material. Six-bar linkage animations and prototypes, our Mathematica four-bar linkage design notebooks, and information on our Mechanism Generator software for SolidWorks. Select this link for a brief history of the mathematical theory of mechanisms and robotics which is an editorial I have prepared for the Journal of Mechanisms and Robotics. A follow on editorial discusses recent research trends in 21st Century kinematics. Since 2004, I have worked with students in Racecar Engineering to develop team engineering skills. Please see my facebook page for photographs and videos of our efforts over the years. 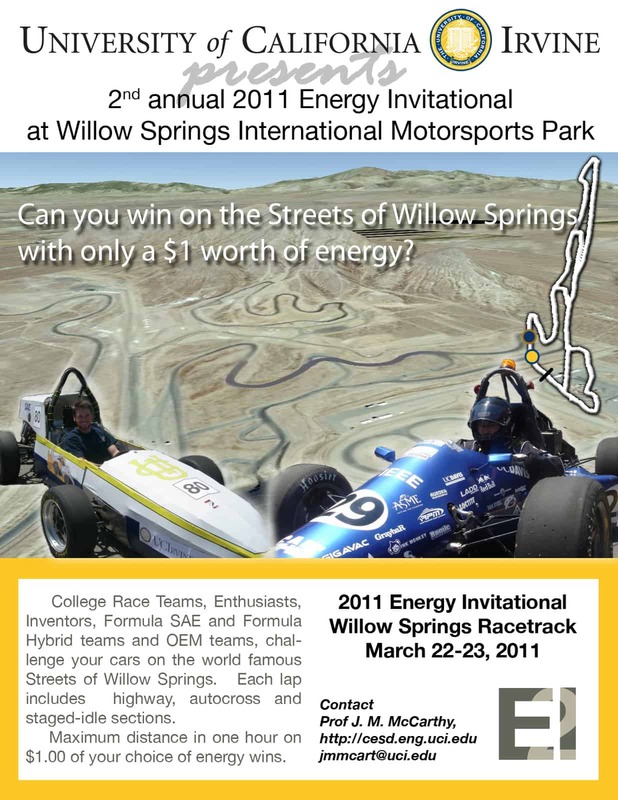 Our 2011 UCI Energy Invitational is scheduled for March 22-23, 2011 at Willow Springs Motorsports Park. Please contact me if you would like to join us. Select this link for convertible cartop and other Linkage Animations. This link has more animations for planar, spherical and spatial four-bar linkages. This bicycle has a rear suspension that is designed to maintain a constant distance between the axle and bottom bracket. It is a Stephenson III six-bar linkage. Simon Kim worked on this in 2006 in collaboration with Chumba Inc. This steering linkage is designed to provide enhanced stability to the UCI XGR gravity racer. The design shifts the body toward the inside wheel and away from outside wheel during the turn, enhancing the resistance to roll-over. Each wheel is guided by a four-bar chain driven by a 2R crank at the steering link. Duplicating this for both sides and coordinating the 2R cranks yields a 10-bar linkage. UCI's XGR racer with this steering linkage won "Most Innovative Design" at the Tuna Canyon and Jack's Peak races in 2006. Douglas Moore and GimSong Soh collaborated on this design. These 6R planar serial chains use cables to control the relative angle of the links of the chain as it opens. They are both one degree-of-freedom systems. A four-bar linkage controls the movement of the base link and a second one controls the orientation of the end-effector. The hexagonal and square starting configurations are controlled by the design of the two linkages. This is the linkage that deploys a sofa bed. Christy Mescher generated this animation using SolidWorks. This is a more radical design for a steering linkage which has a greater shift in body location as well as two additional positions that satisfy Ackermann steering. It uses a six-bar chain to guide each wheel, rather than a four-bar chain. The result is a 14-bar single degree-of-freedom system. GimSong Soh designed this linkage and Christy Mescher constructed the model. This eight-bar linkage was designed to move through five arbitrary positions with one degree-of-freedom. This was done by first positioning a 2-RRR parallel chain such that it reaches the given positions then adding two RR constraints between two sets of links to constrain the movement. This is a POV-ray animation generated by GimSong Soh. Attached is a seminar that describes our homotopy solutions to the design equations for five degree of freedom serial chains that end in spherical wrists. Each of these chains has an associated surface, called its reachable surface, which is the locus traced by the center of the spherical joint. Title: Geometric Design of Mechanically Reachable Surfaces. Select here for the .ppt version. We are developing Java software with OpenGL graphics for the design and analysis of constrained robotic systems. These systems consist of a workpiece, or end-effector, that is supported by one or more articulated serial chains, each of which imposes a constraint on its movement. The constraints provide structural support in certain directions while allowing freedom of movement in others. The undergraduate course MAE 183 Computer Aided Design of Mechanisms and the graduate course MAE 245 Spatial Mechanism Design present the geometric principles of the design of constrained serial chains. These articulated systems have less than six degrees of freedom and can be designed to reach a set of task positions. The kinematics equations of these chains can be evaluated at each of the task positions and then manipulated to define polynomials in the design variables. Solutions to the resulting non-linear equations yield multiple chains that can be arrange either alone or in parallel configurations to provide leveraged spatial movement. The synthesis, simulation, and evaluation of these devices pose a range of challenges in theory, simulation and visualization. The course, MAE 195 Engineering Project Development, focuses on the process of engineering a new product for production. It is assumed that market research, concept generation, and feasibility studies have lead to a commit-to-development decision by management. What follows is detailed design and manufacture under control, with performance testing and corrective actions. Attention is placed on organization, planning, configuration management, operations management, and verification and validation testing. All of which leads to the launch of a product, which in this case is a Mini-Baja race car. Support and maintenance become important issues while testing vehicle performance and training of the driver and support team for the actual competition. The results of the competition provide customer acceptance and feedback. This information is used to define corrective actions and redesign. I was honored to be the faculty speaker at the 22nd UCI Honor's Convocation. Apparently this is the first time a faculty member from the School of Engineering has given this address. There were over 100 faculty and over 2000 students and parents in attendance. This page has been viewed times since September 2006.